Inbound marketing. You may have heard the term already but do you really know what it is? Here are five questions we often get asked about inbound marketing. Inbound marketing is a methodology that utilises several marketing elements such as content marketing, SEO and social media marketing, in order to attract new leads and help them transition through each stage of their buyer journey. Now you’re probably thinking “this doesn’t sound new at all” and you’re right. When Brian Halligan, CEO and founder of HubSpot penned the term “inbound marketing” back in 2006 he wasn’t reinventing the wheel. Similar tactics like “pull marketing” already existed, and so did content and social media marketing. 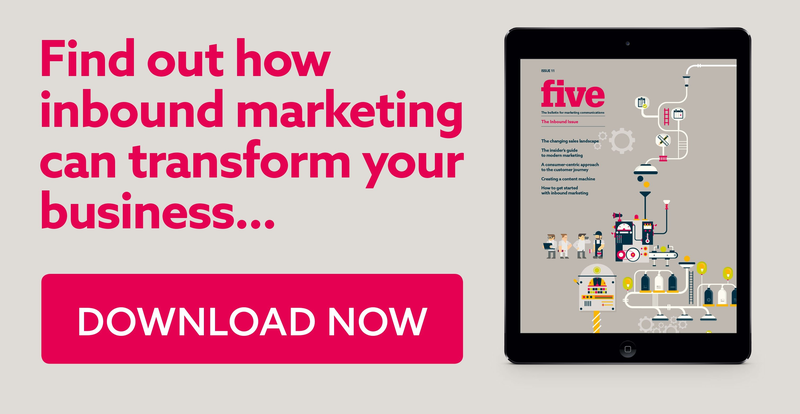 However, by aligning these elements, inbound marketing created a holistic, data-driven approach that helps businesses measure, refine and optimise their efforts, all the way from attracting leads to nurturing existing relationships. You see, Brian Halligan may not have reinvented the wheel but he developed the “flywheel” model – a system for scalable and repeatable revenue generation, that put the customers in the centre and sent the marketing funnel to retirement. Inbound works the same way your team should be working. It’s not about individual skills. It’s all about collaboration. So does Inbound marketing actually work? As I explained above, inbound relies heavily on data analytics and like Shakira’s hips, analytics don’t lie. According to HubSpot’s statistics, “the less companies know about their KPIs, the less likely they are to meet their revenue goals. 74% of companies that weren't exceeding revenue goals did not know their visitor, lead, MQL, or sales opportunities". Inbound marketing, combined with the use of software tools like HubSpot, solves this problem. Does that mean I don’t need outbound anymore? This is one of the most frequent and controversial questions we receive. A lot of people feel the need to defend traditional marketing, and we can't blame them. After all, outbound was the norm long before inbound appeared, and as an integrated marketing agency, we'd be lying if we said "outbound is dead" because it's NOT. The basic idea behind outbound marketing is to broadcast a message to a mass audience, like a speaker, while inbound works by pulling your target audience in, like a magnet. However, this is not a case of "outbound vs inbound". Once again, it's about collaboration and having a well-rounded view of your communications. For example, research shows that in a B2B setting, events (outbound) attract the most leads while case studies (inbound) result in the most lead conversions. Why should B2B companies use inbound? 1. To generate high-value leads for your business in a cost-effective way. The first step in planning your inbound strategy is to create data-backed personas - profiles of your target audience that encompass their various needs, goals and challenges. The better you understand your personas, the better content you can create. With 47% of buyers viewing 3- 5 pieces of content before engaging with a sales rep, your content can make or break your marketing efforts. Even more so when you're a B2B company targeting a niche audience. Plus, organic content costs 62% less than traditional marketing and can significantly increase your website traffic. 2. To support and improve the efficiency of your sales team. Identifying a new lead is not enough. The next step is to nurture the relationship and further educate your prospects as they transition from consideration to decision-making. Inbound incorporates tools like lead management and marketing automation to attribute points to your leads based on their behaviour and trigger pre-determined actions, like sending your leads a follow-up email after a meeting. And while all this is happening in the background, your sales team can focus on the high-value sales qualified leads (SQLs) that are ready to be converted into customers. 3. To accurately measure your return on Investment (ROI). We know that at the end of the day your business needs to be profitable too and that's one more reason why we recommend inbound marketing. By setting S.M.A.R.T. goals and using analytics tools, we can measure your lead-to-customer conversion rates, website traffic, click-through rates and more, closing the feedback loop. This is ideal for B2B companies, such as those in the oil and gas industry, with complex selling processes and a select number of high-value customers. They can benefit from a sustainable system of producing leads with low(er) customer acquisition costs. It sounds great - how fast can I get results? Success doesn't happen overnight, although in some cases we're able to score some quick wins. According to HubSpot's statistics "companies that automate lead management see a 10% or greater increase in revenue in 6-9 months". Generally speaking though, inbound requires a long-term plan for a recommended period of at least 12-18 months, which is divided in two phases: foundation and activation. In the first three months of the foundation stage we'll work closely with your sales team to define your personas and goals, in addition to setting up your database, developing a content strategy and more. After testing, measuring and refining the content, the activation stage will begin. Your campaign will officially be up and running, and your company's flywheel will start spinning improving your customer lifetime value. Pretty neat, eh? And there it is folks. A mini guide to your inbound-related questions. If you'd like to know more or if you're interested in trying inbound marketing, then click here to contact us!